3/26/2013Share this story on Facebook! Check out how one Ithaca College student scored his dream internship at Madison Square Garden during his semester at IC's New York City program. Plus, learn about the classes and personalized guidance that students receive as part of the pre-med track, an Ithaca College option that helps them prepare for medical school. Or, read about a recent IC alum used his music education degree to return home and teach music at his former high school in the Virgin Islands. 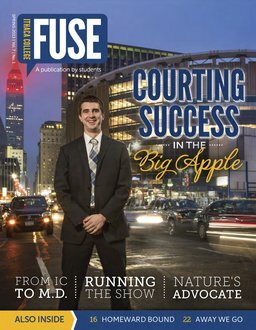 Fuse has even more student stories — from exclusive photo galleries and multimedia to student blogs online. You can even leave us your feedback in the comments section below each story. Have an idea or suggestion? Drop us a line in the comments section, or visit us on Facebook. We'd love to hear about it!